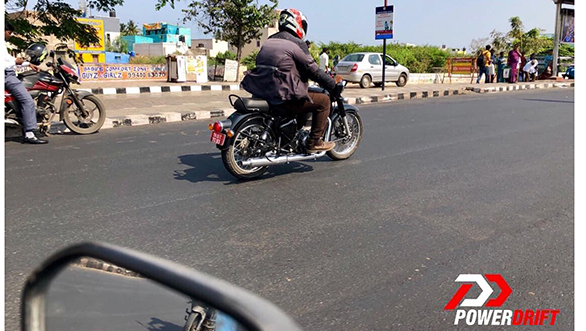 Earlier this week, a Royal Enfield Classic was spotted on test. 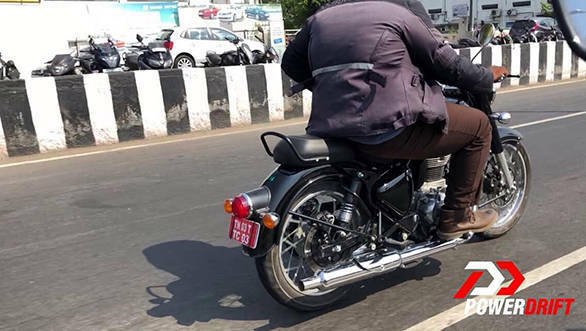 The test mule was uncamouflaged and hinted on what could be offered in the new-generation Royal Enfield Classic series of motorcycles. The first thing that grabs attention is the redesigned tail lamp which we expect to be an LED unit. The suspension units appear to be different than the current model, however, the motorcycle still gets the twin shock absorber setup in the rear. The seat design appears to be different as well. The major difference visible is that the chain drive sends power to the rear wheel from the other side of the rear wheel, that is the left side. This suggests that the engine has gone under heavy revision - could be to make the engine comply with the soon-to-be implemented stringent emission norms. Along with the redesigned engine, the bike gets a new swingarm which houses the rear-disc brake on the opposite side of the driver-sprocket. The front disc brake is also set up on the other side than that of the current model. With a new design expected for the engine, the chassis would also go under minor changes such as different engine mounts. In the front, we hope to see a new headlamp design and a restyled instrument cluster. Even with the newer engine design and revamped styling, the new Classic range of motorcycles will be priced aggressively in the same segment as now. Currently, the Royal Enfield Classic 350 starts at Rs 1.47 lakh and the Royal Enfield Classic 500 retails at Rs 1.84 lakh ex-showroom Mumbai. This pricing pitches the Royal Enfield Classic 350 against the Jawa Forty Two. We expect the heavily updated Royal Enfield Classic to be unveiled soon.